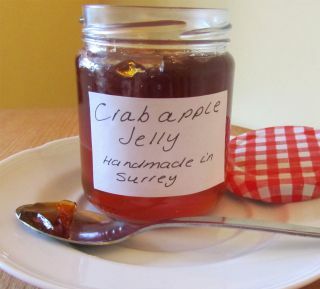 "Crabapple jelly is tops on toast"
Come September, crabapple trees are weighed down with fruit. In a good season, there are plenty to go around, so leave the windfalls for the birds and other local wildlife and pick yourself a bagful of these sour beauties to turn into delectable homemade crabapple jelly. It makes the perfect gift for the local food lover in your life – and remember to label it with pride! Put the washed apples into a large pan and add just enough water to cover. Add the juice of half a small lemon and 6 cloves for each 2lb (900g) of fruit. Simmer until the fruit goes mushy, then use a wooden spoon to turn to a pulp. Measure the juice and then transfer it to a pan along with 1lb (450g) of sugar per pint. Check the jelly has reached setting point by placing a spoonful on a saucer – once it has cooled, it should wrinkle if you push it. Pour into warm, sterile jars and place a waxed disc on top.